The beguiling little Zebra Pleco gains CITES protections called for by Brazil to stop illegal smuggling. Legal, aquacultured specimen shown in the Segrest Farms wholesale catalog. Image © Animal Graphics, courtesy Segrest Farms. Overlooked in the recent flurry of headlines coming out of Johannesburg, South Africa, as the 2016 CITES Conference announced listing changes for some 500 species of wild plants and animals whose survival is considered threatened or endangered, Brazil has moved quietly to add a popular and charismatic aquarium fish for protection under CITES Appendix III. The historic CITES gathering made world news with new listings of the Thresher Shark, Devil Rays, many Rosewood trees, cheetahs, tigers, and hornbills, while one small fish emerged with a new status but little public fanfare. Known as the Imperial Zebra Pleco, Hypancistrus zebra, “L46”, the little loricariad catfish is endemic in the Rio Xingu watershed and is coveted by aquarium keepers but feared to be vulnerable to over-collection, although captive breeding efforts are producing an unknown quantity of specimens to meet consumer demands. With supplies limited, the prices of this species have sometimes reached astronomical levels, and a leading online livestock retailer is currently offering captive-bred Zebra or “Altimira Plectostomus” for $299 each. The Zebra Plecostomus joins several freshwater stingray species which received Appendix III listings at the request of source countries, including Potamotrygon constellata, Potamotrygon magdalenae, Potamotrygon motoro, Potamotrygon orbignyi, Potamotrygon schroederi, Potamotrygon scobina, and Potamotrygon yepezi, all requested by Columbia. Brazil simply requested that all fishes of the genus Potamotrygon be included under Appendix III. An Appendix III listing mandates that international trade in the species be documented, and establishes paper-trail regulations for exporters and importers that must be adhered to. Appendix III listings do not ban trade, nor do they affect interstate trade within a country. Based on current CITES information, these species will require either an export permit from the listing state (in the case of H. zebra, from Brazil or any country where captive-bred), or if exported (or re-exported) from any other country, a certificate of origin is required. While the commercial trade in Appendix III species remains legal, it becomes more expensive and onerous for importers and exporters. The move to add H. zebra to CITES Appendix III is believed to be primarily an effort by Brazil to curtail ongoing smuggling of wild-collected specimens via neighboring countries. According to AMAZONAS Editor Michael Tuccinardi, who has been following the trade in South American fishes, “The fish is illegal to collect, transport, and export in its native Brazil. However, with the ongoing ban and the high price this fish commands on the international market, a thriving black market trade has developed. The fish is still collected in the Xingu’s Volta Grande, but now instead of being sent to Belem for export, the fish must cross into neighboring Peru or Colombia, where some exporters are happy to trade in this high-value rarity. 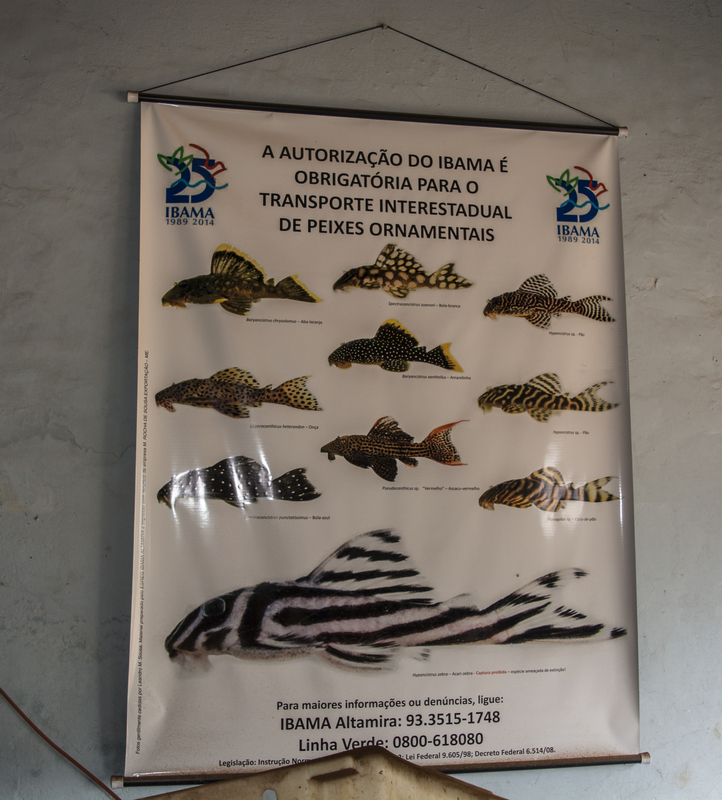 It’s noteworthy that with construction of the Belo Monte Dam, which threatens to wipe out the Zebra Pleco in its native habitat, aquarists who are openly willing to buy wild-caught fish are turning a blind eye to smuggling. Some individuals involved in the clandestine trade privately rationalize their purchases on the grounds that the fish were doomed anyway, so they might as well be exported and bred by aquarists. Within U.S. breeding circles, there are those who take a different, high-minded position: If Brazil is dead set on destroying the Zebra Pleco (by building dams), then there is a moral highground in supporting the smuggling. Ironically, one arm of the Brazilian government is set on saving a species that is potentially doomed by other seemingly unstoppable national plans to build hydroelectric dams in the vast Amazon rainforest. How will the CITES listing help curtail smuggling? Any H. zebra leaving Brazil will have to come with a state-approved export permit, not likely under current conditions. Since neighboring Peru and Colombia are both CITES signatories, illicit imports of H. zebra into their countries will now be harder to pull off without risking legal consequences. Companies in Peru and Colombia will now have to issue certificates of origin for any H. zebra they authorize for export. These countries’ export authorities can no longer turn a blind eye to where these fish are coming from (in the past this was a practice used to launder the plecos into other countries). Inspections in importing countries, like the U.S., will now know to look for those export certificates or certificates of origin with every Zebra Pleco entering the country, something that hasn’t been required before. With almost every country on the planet a member of CITES, the Appendix III listing will monitor all legitimate international trade in the species, including captive-bred individuals being exported. Thus, in the years to come, there will be harder numbers in place that quantify the international trade in captive-bred Hypancistrus zebra. 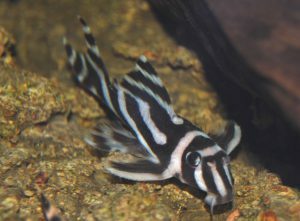 Brazil will know how many captive-bred Zebra Plecos are being reported as passing around the globe. It’s been over a decade since wild-caught H. zebra could be legally obtained in the aquarium trade. This should have been ample time to produce a thriving aquaculture effort behind this highly-coveted species, but despite rumors of large scale production now occurring in Asia, U.S.-based customers haven’t really seen the full benefit of that production yet. Prices remain much higher now than they ever were, with online retail prices often in the $300 to $400 range, and even localized successful breeders asking $150 to $200 per fish. Even so, it may be a long time before supplies get to the point of meeting the aquarium hobby’s insatiable demand for this glorious suckermouth catfish. 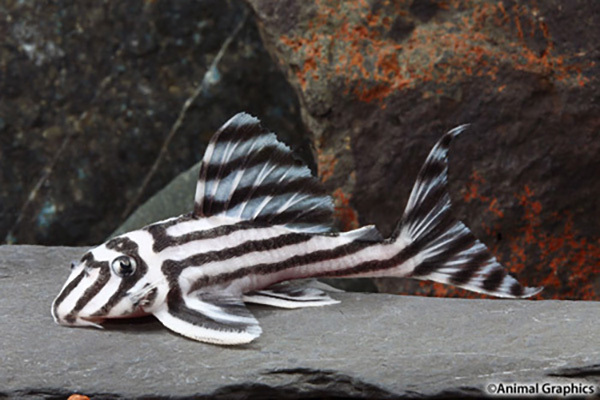 With a CITES Appendix III listing potentially heading off at least some illicit trade in poached Zebra Plecos in the next few months, the near-term supply is expected to get smaller, not larger. If so, insiders say to expect an uptick in price. Meanwhile, the drama facing the wild populations of Hypancistrus zebra in the Rio Xingu are of critical concern to many conservation biologists who are waiting to see what the impacts of the massive Belo Monte hydroelectric projects have on endemic Brazilian species in the wild. In the worst-case scenario, the only living Hypancistrus zebra specimens left on the planet will be in the tanks of public and private aquarium keepers. Great article. Thank you for the information. I had a wild caught specimen in the late 80s or early 90s. I’ve been in love with the species ever since although not owning another until recently through a US breeder. What ever happened to the Blue Eyed Pleco that was so readily available in the 80s and 90s. Can’t seem to find anything online. Great article, but here in Australia we only have captive bred 046 available and prices start at $700+ for a 3cm juvenile. Makes your article prices seem very cheap indeed! The cynical side of me (so, all of me then) believes that this move is calculated in order to explain away the sudden dearth of specimens as a good thing (“they’re protecting it from the evil smugglers and aquarium trade!”) rather than “they’re all dead because of the dam”. Thank heavens for that evil aquarium trade, the species has a chance of surviving in captivity. They aren’t being aquacultured on a large commercial scale, probably because they mature so very slowly, but hobbyists are definitely breeding them. You are wrong about there not being commercial aquaculture of this species. Check out Bellenz fish farm in Indonesia: http://www.bellenz.com/home.php. There was an article on their H. zebra breeding programme in Amazonas in March/April 2015. Frank, that’s correct. There are probably now over 100 commercial-scale breeders of H. zebra worldwide, with many more smaller/hobby breeders. That said, it’s still challenging and expensive to produce these fish so prices remain high, and in most cases it’s cheaper to buy a wild smuggled fish than it is to buy a captive bred specimen. They are very expensive in the USA ($400). However, in Europe they seem to be plentiful and much less expensive. Can they ship from Europe to the USA? And can’t they be captive bred in the USA like they are in Europe? They are very expensive in the USA ($400). However, in Europe they seem to be plentiful and much less expensive. Can they ship from Europe to the USA? And can't they be captive bred in the USA like they are in Europe? Frank, that's correct. There are probably now over 100 commercial-scale breeders of H. zebra worldwide, with many more smaller/hobby breeders. That said, it's still challenging and expensive to produce these fish so prices remain high, and in most cases it's cheaper to buy a wild smuggled fish than it is to buy a captive bred specimen.